Hotels in Japan are not cheap. It's true that you will probably get amenities like swimming pool or gym, but it doesn't necessarily provide you a local living experience like Airbnb, which I highly recommend you to try! Airbnb is a house/room renting service that is provided by the locals, so that you will find and book unique homes and experience the city like a local. Not only when you go out to a restaurant or joining an event, it is also part of the traveling experience when you live in it too. Cheap and Affordable - Airbnb in Tokyo ranges from $40-$200, a lot cheaper than most hotels in the city. Learning about Japanese neighborhoods - Most Airbnb are located at residential area. You can really get to walk around a typical Japanese neighborhood and learn about them. I really love how peaceful, lively, and convenient it is. (I lived at Setagaya before) Unlike our typical American neighborhoods, (with lots of cars) in Japan (where people rely on public transportation) lots of people are walking on the streets throughout the day. Learning from your Host - Usually, your host speaks somewhat a little bit of English, which is great! You get to ask a local whatever you want to learn about this place! $35 Credit to try Airbnb for your next Japan Trip? Are you ready to try out Airbnb? Here's a $35 credit for your next travel, just click HERE ! My first Airbnb experience was actually sharing a house with a local Japanese woman who lives by herself in Setagaya. She recommends me lots of wonderful local places and the popular tourist spots. I get to learn about her work, hobbies, etc. It was actually pretty fun. I also rented an entire place near Oyama, North of Tokyo. The host speaks a bit of English and introduce me to his friend who is an owner of a nearby ramen shop. Of course, I dropped by at the ramen shop and make some more new friends! Local Izakaya (yakitori bar) is great too, typically a lot cheaper than the ones near the busy city. It is for the local businessman and woman to come grab a drink before heading back home. It's also a place for friends gathering too. I happened to chat with the owner of the izakaya bar as well because he happened to study in Portland a while back ago too. I tried living at a condo near Kachidoki, South of Tsukiji Market this year as well. It's a nice area with lots of children. This is the first time I see a playground/park that always have so many kids throughout the day. The area actually had quite a few Indian restaurants, in fact, I also noticed a lot of Indian working at convenient stores, restaurants, etc. For me, I see mostly Japanese, Chinese, Korean, White, but I rarely see Indian-Japanese. (Trying to think of a way to express something like Asian American) I learn that there are actually generations of Indians who have been living across Japan for over a century already. In Sapporo Hokkaido, I rented an apartment like 2 minute walk away from the 'Sapporo Factory Mall". (See photo above) The living room and bedroom is in one large room. With a sliding wall, you can convert it into a small living room and bedroom. (So cool!) The place was very clean that sleeping on the floor is totally fine. For beds, they provide fold-able mattresses so all you need to do is to unfold and lay it on the ground. They provide a washer and dryer too, which is great for my long trips. It was nice to have a kitchen, unfortunately I didn't really get a chance to use it because I am outside most of the time. Ready to experience Japan (or other countries) from Airbnb? I'm glad that my Airbnb experiences help you learn more with Airbnb! Here's a $35 credit for your next travel, just click HERE ! This sounds like a great way to experience Japan. Thanks for the tip! You are welcome! I hope you get to try it sometime in the future too! My son and I have been wanting to visit Japan for many years but was always leery about where to stay (hotels, Airbnb, rent a home) mostly because we do not speak the language. I feel after reading your post that our fears can be set aside and just go for it!! I totally understand the part about the language barrier. But so far, all of the hosts I met speak English, or at least conversational English. Even though you don't get to meet them in person (self-check-in), you can text them in English. I am glad my post helps you! Next time I go to Japan I will definitely try airbnb. I have one airbnb experience in Thailand and it was wonderful..and so much cheaper than a regular hotel. Thank you for the insights! You are welcome! That's great to hear you had a good experience with airbnb in Thailand! I totally agree, hotels are really expensive nowadays. And airbnb is actually reasonable for their price + experience local lifestyle. Thank you for this advice! I used some "home exchange" services in the past, but airbnb is actually easier and more reliable. Thanks again! I've been slow to embrace AirBnB but I've recently done so and am looking forward to doing so again. I did not know it was available in Japan and would definitely use it as I am very cost-conscious and would love the chance to experience the culture of staying in someone's home. I think an Airbnb is a great idea instead of a hotel, especially if its less expensive. 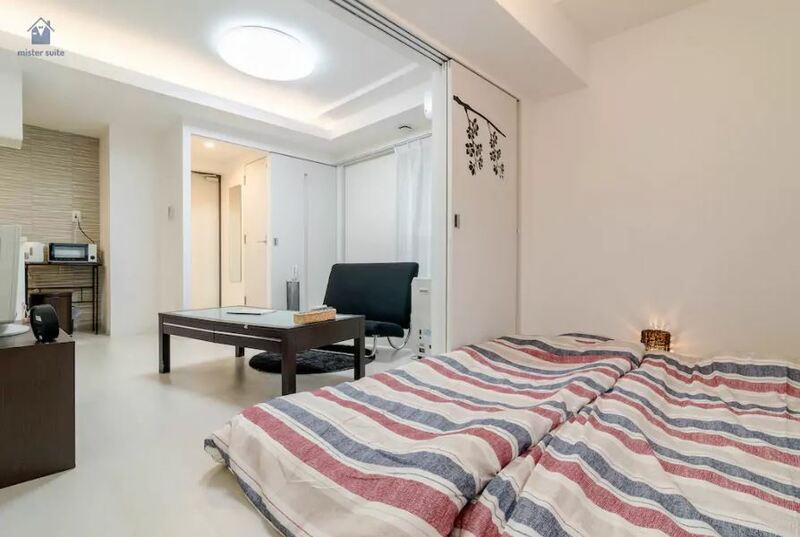 I absolutely recommend Airbnb for anyone going to Japan. It is a completely unique experience especially if you change up neighborhoods. Vast difference being in Shinjuku then say Meguro or even Azabujuban. It's also really cheap. I think I averaged about 30-40 a night. I know a little of Airbnb, you gave a better description of what really is, thanks! If I travel and book something I will enjoy the $35 off you are giving us! Thanks so much for the info! Hopefully I get to go with my own family soon! How do you know you can trust the host. Is one question I always wondered. Airbnb suggests that you confirm the ammenities provided with your host. Sometimes, you can end up in a room without a tv, a phone or air conditiong. Great tips! I hope to use them soon! I loved that you shared your own Airbnb experience! Whoa, this is actually really helpful. I've always wanted to go to Japan, this seems like a plan. The manager at these venues in Houston suggested we make custom choices and make the menu a little more personalized. The next time you need to hold a conference, have a wedding, or set up a whiskey tasting, think about doing it at this venue. This blog have came on that time when I was about to travel to see my relatives in Japan through Travel Merchants. Glad to read the above experience. This would be a great way to experience and immerse yourself in Japanese culture! A solid ethical reputation in the industry should be the first thing to consider. There are a lot of great host agencies out there, and unfortunately, there are a lot of bad ones. So, how do you sift through them all? So to get good host for travellers contact with them.